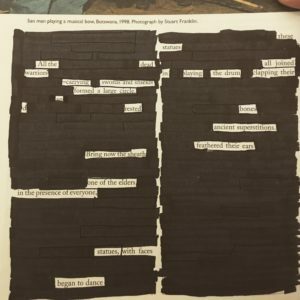 I want to show you how to write an interesting poem in just a few minutes using ‘The Blackout Method’. You don’t need to be a poet or an artist or even consider yourself remotely creative – the method will do it all for you! Why show you this? Because it’s super easy to do and surprisingly entertaining. This exercise is a great reminder that engagement and satisfaction don’t have to exclusively come from big things like a career change or falling in love – but can also come from little moments of flow we can access whenever we like. 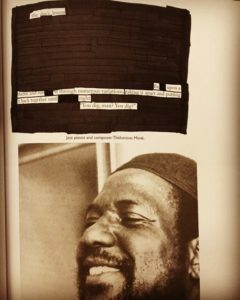 “What you’re doing when you’re making a blackout poem, in the words of Allen Ginsberg, is ‘Shopping for images.’ You want to begin by looking for a word, or a combination of words, that forms an image in your head. (Tip: the best images are usually made up of nouns and verbs.) You want an anchor – a place to start. If you identify this anchor, it’s easy to branch out from there. Once you identify your anchor, you want to move around the page and find words and phrases you can link to that anchor. Try not to have a preconceived notion of where you want to go. Let the method take you for a ride. That’s it! Don’t overthink it. Enjoy! If you’re interested in learning about finding pleasure and lasting satisfaction in activities that bring about a state of “flow”, check out this video below to see famed Positive Psychologist Mihaly Csikszentmihalyi’s TED Talk on the subject. 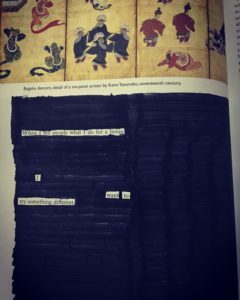 And just for fun, here are a few of my own blackout poems!